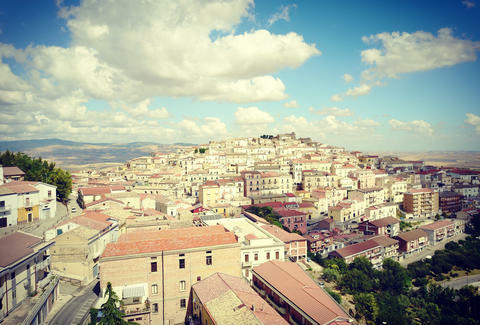 Stop dreaming and get to Italy: There's world-class wine, even better mozzarella, and the mayor of this tiny Italian town will pay you to move there. Mayor Nicola Gatta wants to restore Candela, a small medieval town in southern Italy, to its former bustling glory, when "travelers called it 'Nap'licchie' (Little Naples), for it streets full of wayfarers, tourists, merchants and screaming vendors," as he described it to CNN. In the 1990s, over 8,000 people called Candela home, but today its winding streets host just 2,700 residents. Candela's town hall isn't offering a fortune, but the sum will definitely ease your relocation. You'll be supplied with 800 euros ($947) if you relocate by yourself; 1,200 euros ($1,420) for a couple; families of three get 1,500 to 1,800 euros ($1775 to $2,130); and families of four to five will receive over 2,000 euros ($2,371). That should at least be enough to cover your obligatory scooter. Also note that there are three conditions: New residents must take up residency in Candela (though that's probably obvious); they must also rent a home (many have terraces and balconies); and finally, they must have a yearly salary of at least 7,500 euros ($8,875). Candela's newest citizens will have the pleasure of living in a calm town adorned in baroque architecture, surrounded by majestic rolling hills, and apparently featuring the world's smallest alley, a mere 35 centimeters long. "It's a quiet and simple lifestyle. No crowds, easy to move around, no traffic nor smog," photographer Francesco Delvecchio, a Candela resident, also told CNN. And according to Mayor Gatta, there are hasn't been a crime in 20 years. Thus far, six families have settled in, and five more families have applied. There's no indication of how much money they're willing to hand out in total, so you should get on that and never look back. James Chrisman is a News Writer at Thrillist who will be applying. Send news tips to news@thrillist.com and follow him on Twitter @james_chrisman2.